Bake potatoes until soft, about 25 minutes. Allow to cool. Scoop flesh from cooled potatoes and mash in a bowl. Add egg, garlic powder and salt, mixing well. Add flour, 1 cup at a time, until a workable dough forms. Take 1/4 of the dough, place on a floured surface and roll into a 1/2-inch diameter snake. Cut into 1/2-inch pieces and press each gnocchi with the tines of a fork. Heat olive oil in a saucepan over medium-low heat. Add shallots and sauté until soft but not browned, about 5-7 minutes. Add sage and flour and cook for another 3 minutes. Whisk in Silk, wine, salt and pepper, bringing to a simmer. Cook until thickened, stirring occasionally, for about 10 minutes. Add gnocchi in two batches and simmer until they rise to the top. Remove with a slotted spoon and place in a strainer. 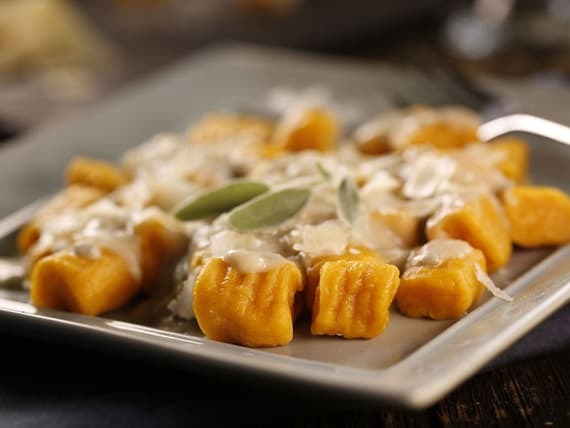 To serve, add gnocchi to sauce and coat well. Spoon into bowls or onto plates and sprinkle with Parmesan, if desired.